All is Film music. 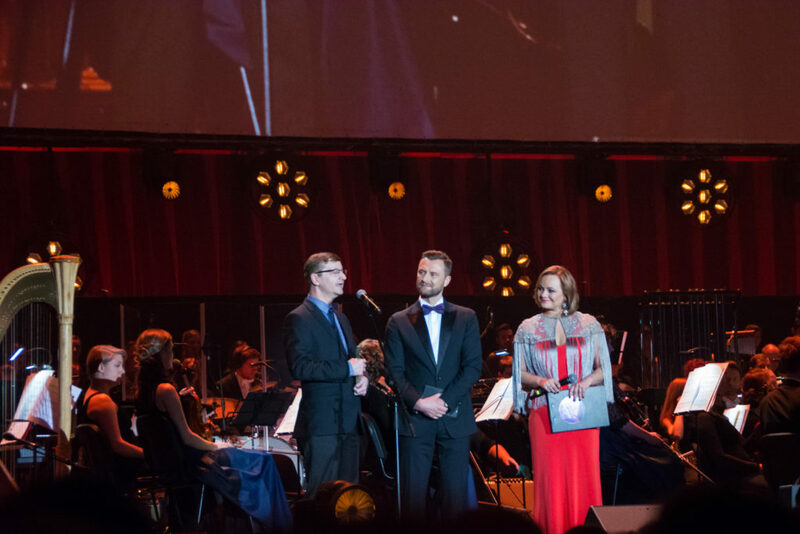 That was the motto of this year’s gala concert for the 10th anniversary of the FMF. And with the range of different film music that was played this evening, you might just believe the organisers tried to actually include a bit of ALL film music. Spoiler alert: this concert was really good. The concert was held in the Tauron Arena in Krakow. The place is not exactly the best choice acoustics-wise, but it is probably the only hall in Krakow which has enough space to hold the expected audience. And that calculation was quite correct: as far as I could see, the concert was basically sold out. I am not quite sure if I just did not notice it as much or if the FMF did some technical magic, but I had the feeling that the acoustics (especially the echoes) were not quite as disruptive as the previous year. The only times I did notice the acoustics, was during some very percussion-heavy tracks and the announcements. The concert started up with Diego Navarro, the main conductor for the night, walking onto the stage in the company of a young boy. Without any kind of additional warning, the audience was thrown into a tension-filled suite from the Fellowship of the Ring. After the young soprano left the stage under thunderous applause, the audience was allowed to regain their bearings during some introductory words by Magdalena Miśka-Jackowska, who has been a constant FMF companion throughout the previous years. After this epic introduction to the concert, I was expecting something a little quieter to follow up, but I was proven completely wrong. Instead, the brass section of the orchestra got themselves a proper workout playing “The Imperial March” which was then followed by “Princess Leia’s Theme” with a flute part being played by Sara Andon. The progression to gentler tunes that had started with “Princess Leia’s Theme” continued with “Where is Mr. Barrie?” from the Finding Neverland score. The lighthearted melody was splendidly supported by the sweet tunes of the children’s choir. 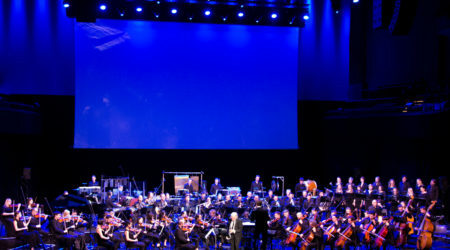 The next piece, “The Hanging Tree” from James Newton-Howard’s Mockingjay, started up with a lovely, soft, and breathy solo by Natasza Urbańska, expanded through the whole orchestra and culminated in the addition of the choir, which left the audience shivering in their seats with the return to more dramatic music. This took a quite ominous tone in the next track: the suite from Humble Servants by Maciej Zieliński, which surprised me with a rather spooky combination of harp and electric cello that turned towards a more action-oriented ending. After the first block of music, the FMF Ambassador Award, a distinction for major contributions to the film music scene, was bestowed on Robert Townson. His way to the stage was accompanied, as all FMF Awards are, by Diego Navarro’s fanfare. Mr. Townson took the opportunity of saying a few words of thanks to present and absent friends who have joined and inspired him in his work for film music. 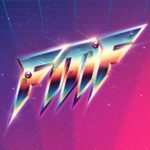 The second part of the first half of the concert – and yes, that makes the concert sound exactly as long as it was – started with the Fargo suite by Jeff Russo, who could unfortunately not attend the FMF. The rather sensual violin of this piece was followed up by another flute adaption played by Sara Andon. She played Alan Menken’s new Beauty and the Beast score, which she topped off with a solo interpretation of the theme. The sweet and cheerful tunes of our childhood were then promptly, and rather literally, blown away by Brian Tyler’s suite from Thor: The Dark World. The powerful choir and fast-paced rhythms did not only grab the audience, the orchestra seemed to have some trouble staying in their seats as well. Brian Tyler conducted this piece, as well as his following soundtracks, himself. Following up were the new Power Rangers score, which gave the e-cellist another serious workout, Assassins Creed: Black Flag, which was the most cheerful and melodic of Tyler’s pieces, The Fast and the Furious 8, which was pure e-guitar and brass-filled action, and the lovely, tension-filled “Ahmet’s Theme” from the then not-yet-released The Mummy movie. Tyler finished up his part of the concert with the world premiere of his Turtles score, which shook the whole concert hall with its powerful percussions. The aftermath of this piece left the audience awaiting the next piece in a couple of moments of awed silence, in which somebody failed to announce the intermission in a timely fashion. But since this gave us a moment to let Brian Tyler’s music reflect in our minds, it felt like an intentional hesitation, rather than a mistake. The second half of the concert had Diego Navarro taking up the conductor’s baton again. He started out with a hauntingly beautiful rendition of Hans Zimmer’s “Time”. The vocals were performed by Joanna Radziszewska and could not have been done any better, in my opinion. This was followed by the suspense-filled suite from Belfer. The composer, Atanas Valkov, took up the seat at the piano himself. 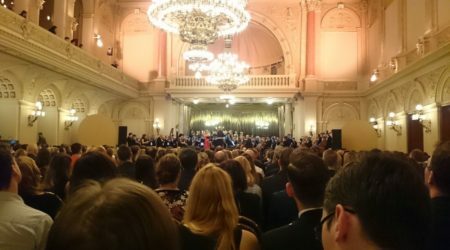 Afterwards, the Young Composer’s Award was bestowed upon Paweł Górniak. He won the contest to re-score a scene of Emerald City, which was originally scored by Trevor Morris. His winning entry was then performed by the orchestra. I enjoyed the sweet flute tones playing over the suspense-filled rest of the orchestra. Following this, Trevor Morris came up to the stage to conduct his original version of the Emerald City score, which felt to me a bit more oriented towards action and drama than the previous piece. It was rather interesting to see how two different pieces of music can change the whole atmosphere of the exact same scene. Neither version fit the pictures better or worse – they were just two different perspectives on the same matter. The baton then got passed along to Abel Korzeniowski, who performed a melodic, yet wonderfully creepy, suite from Penny Dreadful. The wandering baton then found its way back into Diego Navarro’s hands, who led the orchestra through Jan A. P. Kaczmarek’s suite from Unfaithful. I especially enjoyed the romantic piano and string combination in this piece. Right in style with the numerous previous mood changes, the next piece, “Listen” from Dreamgirls, was a proper power ballad performed by Edyta Górniak who would also perform at the Titanic concert the following evening. Her powerful voice opened up the stage for a small intermission, in which the organisers and volunteers of the FMF were officially thanked. Next up was a short break for the orchestra, as Sean Callery led a group of jazz musicians through his Homeland score from his place at the piano. He seemed to have quite some fun performing this piece, despite the piano sheets abandoning their rightful place at the very start. 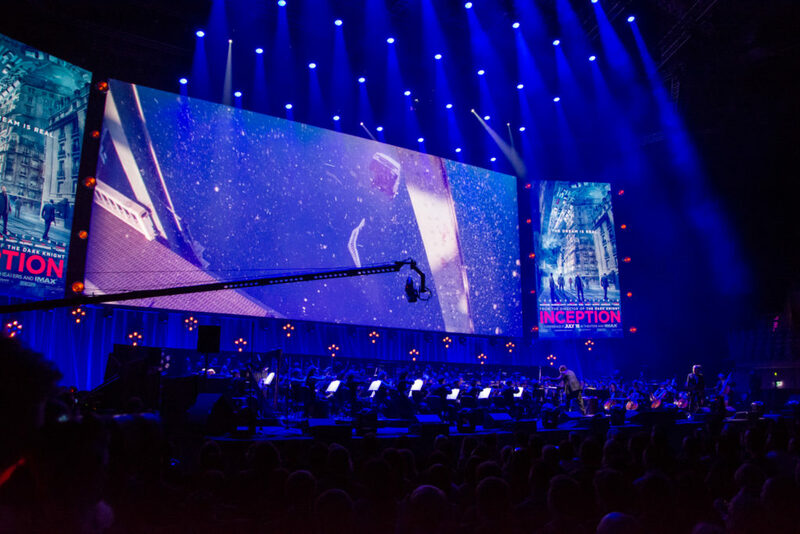 Sean Callery followed this performance by conducting the Polish premiere of his 24 score. The heroic and action-packed score made for a nice contrast with the more mellow jazz piece before. And while we were still in the mood for jazz, the orchestra followed up with the world premiere of the lighthearted and fun La La Land score. This suite was specifically arranged for the FMF by composer Justin Hurwitz. Both the orchestra and Diego Navarro seemed to have immense fun while performing the piece and so did the audience. The last award of the evening, the Kilar Award, was then presented to Howard Shore for his lifetime achievements. 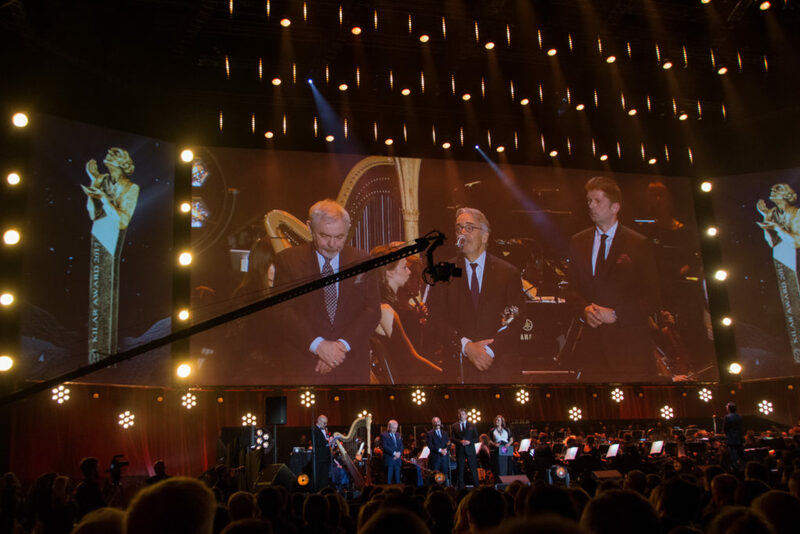 Howard Shore, who had disclosed in an earlier Q&A that he composes, orchestrates, and conducts all his scores entirely by himself, then proceeded to tuck the award under his arm and say a few words about his great admiration of Wojciech Kilar, the FMF in general, and Diego Navarro’s wonderful conducting. 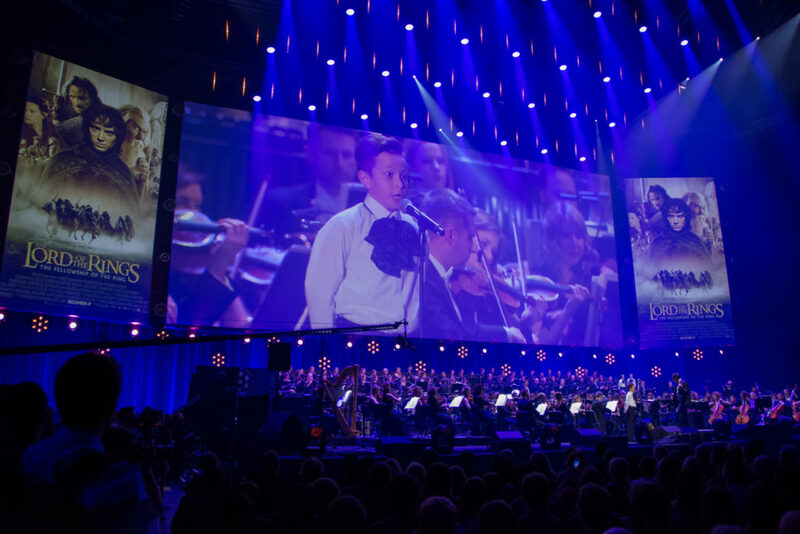 In honour of the awardee, the last part of the concert was dedicated to the Lord of the Rings soundtrack: “Lighting of the Beacons,” “Last March of the Ents,” “Mount Doom,” and “The Destruction of the Ring” made for a suitably epic ending of an impressive concert. I was very pleased with the emotional progression of the music choices. There were plenty of changes in mood between the different pieces that were played, which ensured that the concert, despite its considerable length of four hours, not once turned boring or tiresome. Another thing that I found very interesting to watch was the very different conducting styles we got to see throughout the evening. Diego Navarro’s fiery, passionate, conducting stood in stark contrast to Brian Tyler’s controlled and strict motions. 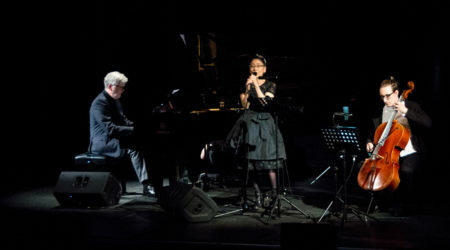 And while Trevor Morris gave me the impression of a sturdy tree in a musical storm, gently moving with and around the music, Abel Korzeniowski seemed at times like he would love to leap off into the orchestra and embrace every single note that was being played.